The above models (in Broshuis colours) will be available from Broshuis as a set of four but also sold seperately. Picture below shows prototypes. 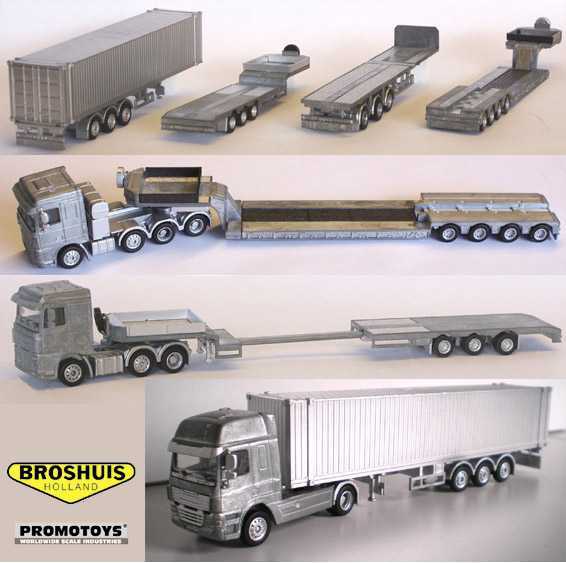 - above models are also available with Ford G917/3000, Mercedes L3000 or KHD 3000 cabs. Information from Classic Mint: Each model will feature all brass construction and have the respective implement installed both tools have 360 degree rotation and jaws are functional. The base excavator is identical to our first release (item #14007) except that two more auxiliary hydraulic lines will be added plus the OSHA required cab protector. No bucket is included. Please note: Although not shown in these pre production photos all forward rubber hoses will be armored. In these photos only 2 armored hoses are visible.